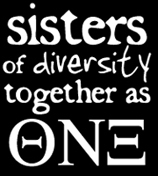 Multicultural Sorority, Inc., at the University of Pittsburgh! | Our mission is | To promote leadership, multiculturalism, and self-improvement, through academic excellence, involvement in and service to the campus and community, as well as being living examples of sisterhood, across different races, cultures, religions, backgrounds, and lifestyles. | What's New? | We hope everyone has a great end of Spring Semester! Good luck with Finals! We are now accepting applications for our ONE-der Woman Scholastic Leadership Award. The winner will recieve $200 book scholarship. Applications are due April 21st, 2013. Download an application from our Scholarship Page. Friend the Nu Chapter on Facebook and follow us on Twitter @thetanuxi_pitt! Want to get in touch with the Nu Chapter? Our officer contact information can be found here. Thanks for stopping by, and please leave us some love in our guestbook!